Vigneshwar Bhat Holds Degrees in Mimamsa, Dharmashastra, Agama and Yajurveda. He is pursuing his PhD in Karmamimamsa Philosophy and is a distinguished Pandit. 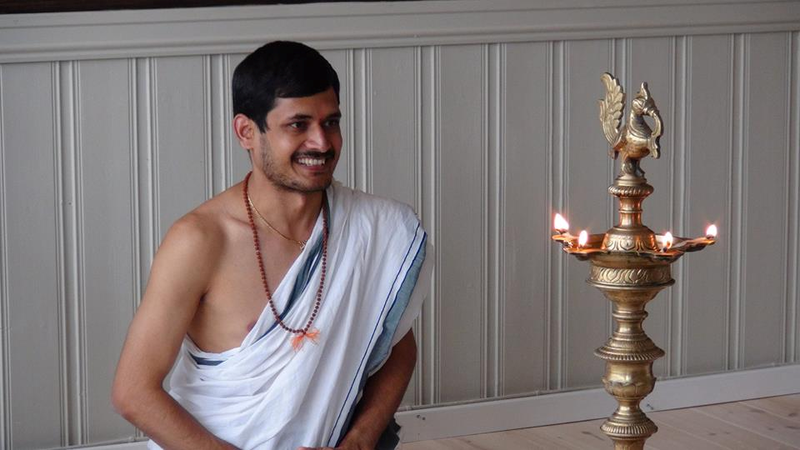 He has a traditional education from a Gurukula in Ummacige and the Sanskrit College in Mysore. He is Indian champion in debate within the philosophical branches of Mimamsa and Dharma Shastra. Vigneshwara has also written several books in Sanskrit and teaches as an Asst. Professor at, the Amrita Vishwa Vidyapeetham, Amrita school of arts and sciences, Mysuru campus, and he was a guest Professor at Rama Krishna Mission in Mysore.